Paris-Gallieni international bus station is located in Bagnolet in the east of Paris. This major bus station is one of the most important stations for European coaches. This bus station was created in 1993 under Bel Est Gallieni mall. Paris-Gallieni international bus station is composed of two levels covering over more than 6,000 sq.m². The reception offices are on the first floor for all passenger registration formalities, ticket sales for the coach Eurolines and any other information.. The second floor is reserved for parking of all vehicles, taxis and the arrival and departures of all passengers. There are no automatic or manually-operated left-luggage lockers at the bus station (if necessary you can get information at one of the SNCF information offices to leave your luggage in a left luggage storage in one of the SNCF train stations - Check Gare du Nords's left luggage storage service or go and find information at Gare de l'Est ). There aren't any warm places to stay here (café, restaurant...), only boarding platforms. The bus station is open every day of the year from 6 a.m. to 11 p.m. Its location is ideally situated for easy access to Paris and easy also to get to by car. 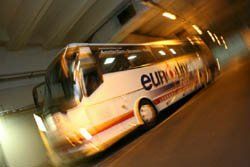 The bus station is based at one of the exit points of the outer ring road of Paris (Porte de Bagnolet) at the level of an important motorway interchange between the ring road and the junction leading to the A3 highway. The Bel Est mall and the bus station of Paris-Gallieni are one – you can’t miss it! To get to Charles de Gaulle airport from the bus station Gallieni take metro line 3 to République station. And then change and take metro line 5 to Gare du Nord station. Take RER line B in direction of CDG airport. Alternatively, get off at Gare de l'Est station (metro line 5), exit the station and take the bus line 350 to RoissyPôle (in direction of Charles de Gaulle airport). You can also find the tramway T3B 10 min from where you are at the station porte de Bagnolet. To get to Berlin, Hanover or Braunschweig you can also use the German coach company "BerlinLinienbus" they also have offers of departures or arrivals at Paris-Gallieni. To find accommodation located not far from Paris - Gallieni, browse through the list of hotels near the bus station and Porte de Bagnolet. Check our presentation of Bagnolet's neighbourhood to know a bit more about where you're planning to stay.